the adventure of living and traveling the world is reflected in the mail art series. the "mail" used is actual mail i received while living abroad. lovely!! I can feel the sweetness! I've not been by much recently & have quite enjoyed catching up a little. You are right about "pretty" generally but this is so cute it works as an observation & tacit appreciation of those elements. Nice job, interesting composition !!! very nice. love the bird within the collage and that you have echoed it with the small bird figure . . .
Excelente trabajo!!!. Tu galeria es muy creativa, innovadora y muy personal!!! You always have such interesting "portals to the past" with your mail art pieces! I like this piece very much! Tis femme with an 'old world ' flavour. So sensitive and personal. I love it!! Cool work, Jennifer. I love the pink with the rest of the elements!! Very interesting work. 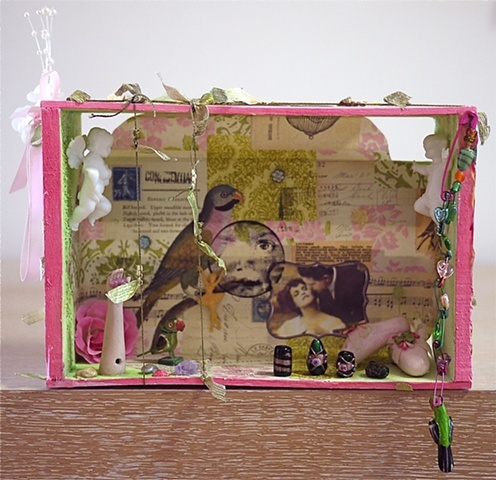 I love Joseph Cornell, and your work reminds me of his. lovely reminiscence of a very individual traveller...my congratulations ! have a good week..... this I like ever!!!! What a beautiful artwork. Love it. B~E~A~U~T~I~F~U~L!I like your box! Wonderful artwork. A great idea to use a mailart-envelope, it is a beauty. WOW! What can I say that hasn't been said! Stupendous! Creative! Sacred! Mysterious! Healing & genuine! Love it all, Collage-Nikov. Best wishes for a great week-end! What an idea !! :) Fantastic !!! Interesting piece. I love the hand in the lower left offering us a personal letter or mail. Nice one Jennifer. Totally cool, Jennifer. Happy New Year! Muito bom trabalho com grande criatividade!! Abraço.